About last year this time (well, early March), I did an indoor triathlon, and the toxic masculinity and toxic femininty that drives, if not toxic, well, then frankly insane people to participate, (and, frankly, people not, good with commas in complicated sentences) (where was I? Oh, yes, about to comma), leads me to thump my chest and proclaim how masculine I am, or not, based on what I did that day (or, weekend). On Saturday, I participated in the first Chesterfield Family Center Indoor Triathlon. I say first boldly because this means I’ve been in all of them ever which is a little like the triathlon coach at the YMCA having been in all of the Republic Tiger Triathlons (which is eighteen or nineteen so far). So my participating in all the CFC triathlons so far is a little like that, but easier. I was stoked (should I have put that in bold, or should I have placed an extraneous comma somewhere?) 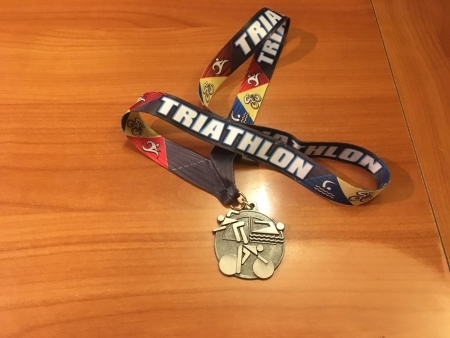 because the indoor triathlon had only a ten minute swim, and I am not a very good swimmer (the triathlon coach might not have actually given me nicknames, but he could have). So I thought that would not put me too far behind. But then I read the scoring system, and apparently, it was scored according to your position in each event added together, and the lowest score wins. Well, I thought, coming in 21st in swimming would put me so far into the hole that I would not recover unless they awarded negative numbers somehow, so I thought I was outside the medal range, but. I got second. Out of like 24. I’m not sure how it happened, but given that the swimming was given by lengths of the pool, I can only assume that there were a lot of ties among people who swam twenty and fifteen laps meant I was in third or fourth or fifth and not actually 21st. I did some overdue chores around Nogglestead on Saturday and Sunday. How overdue? Well, I vacuumed the lower level, which includes the office in which I spent ten or eleven hours a day. You have heard of the Nogglestead Christmas stragglers? Well, if we’re being scientific, the real stragglers are the bits of plastic “Christmas tree needles” and glitter still on the floor, okay? I am not proud of it, but I did it. I reupholstered a hassock, sort of. 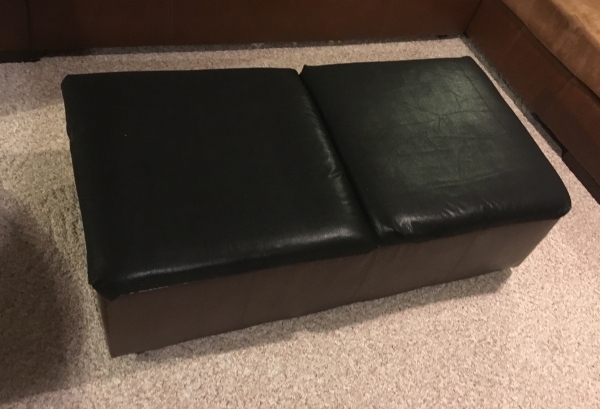 The footrest has two top panels that you can remove to store things inside the body. Covered in faux leather, it sits before our main television, and after almost ten years of feet resting (and football games and their attendant book browsing), children playing, and cats a-leaping, were worn to the point where I covered them with a throw blanket to hide the panels’ damage. 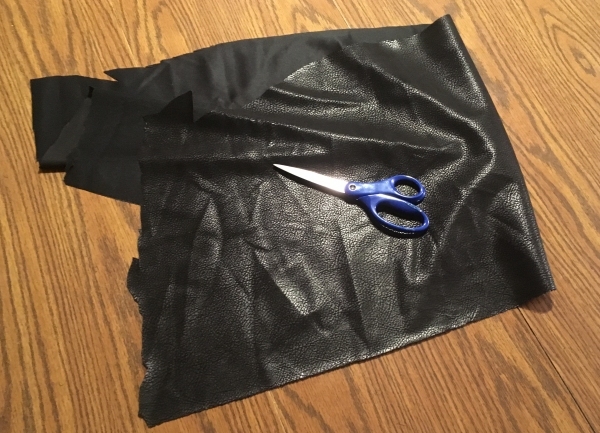 Sometime last fall or early winter, I picked up some black faux leather from Hobby Lobby to replace the worn brown because I’ve heard that black goes with anything (except, I fear, a black belt with brown shoes, although I’m not sure why). So as I was teaching my oldest child a lesson about procrastination and that, sometimes, you can spend more time dreading, putting off, and regretting putting off a task than it takes to do the thing. And that I’m more prone to do that with something I don’t know I know how to do. But the results, this time, were adequate. My beautiful wife was amazed that I knew how to do upholstery. But I didn’t; I figured it was a little like wrapping a Christmas gift, but with staples instead of tape. A little like that. Now, to tackle the arm of the sofa where leaping cats have torn, but that repair is not as simple and will require a bit of faux leather gluing, so I’ll put that off for a while yet. On the downside, the project has not been on my to-do list long enough to count as actual DeRooneyfication. On the plus side, I have enough faux leather left over to make something for my beautiful wife. I grilled. In the cold. And the rain. And the fog. Although that’s not really impressive. 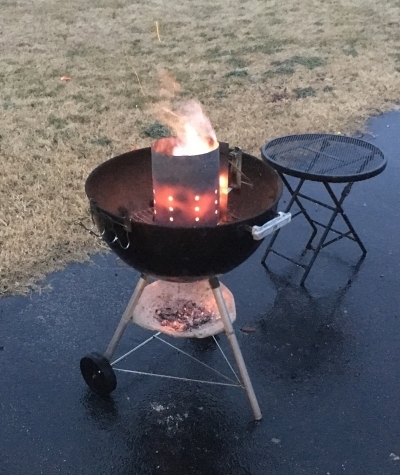 I’ve grilled four times in the last week, and today’s weather was not as bad as some this week. But you know what’s bad weather for grilling? So I’d like to say I’ve had a good, masculine, fulfilling weekend. How about you? UPDATE: My beautiful wife informs me that I have not done anything so masculine this weekend so as that she would wear anything I would make out of those scraps. But there is next weekend, I think to myself.